Plan your next inspiring conference or product launch in our largest on-site event venue, the De Anza Ballroom. 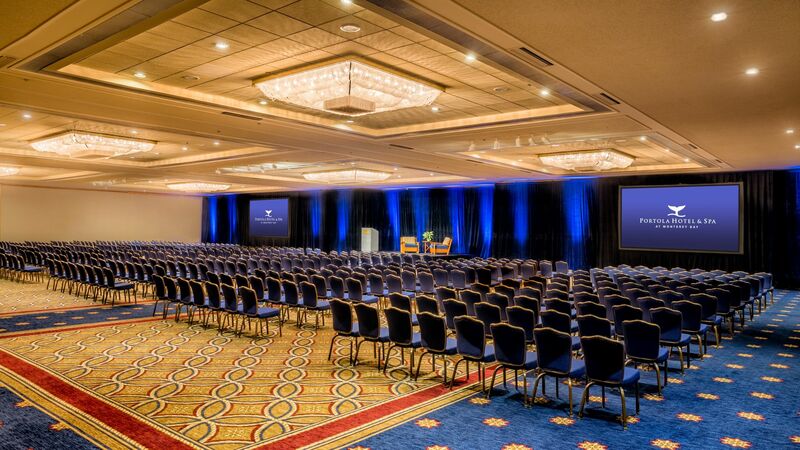 Offering easy access to the hotel lobby and Conference Center, this ballroom features over 10,000 square feet and can accommodate up to 1,000 attendees. The Bonsai Ballroom is on the first level of the Hotel and offers over 2,500 square feet of space for meetings, conferences, and events that can accommodate up to 200 attendees. The perfect setting for an important business meeting, the Executive Boardroom is 760 square feet and can accommodate up to 20 guests. The Cottonwood Room is 1,500 square feet and can accommodate up to 100 guests. Located on the third floor of the main building, enjoy access to the second level of the Monterey Conference Center as well as Peter B’s Brewpub. Able to suit a wide range of event needs, the Ironwood Room is 1,400 square feet and can accommodate up to 100 guests. Found on the third floor of the main building, the 1,400 square foot Redwood Room can accommodate up to 100 guests and offers access to the second level of the Monterey Conference Center. One of our more intimate meeting venues, Driftwood I is 712 square feet and can host up to 56 guests. Host up to 36 guests in the room Driftwood II, which features 460 square feet of space. Perfect for mid- to large-sized meetings, conferences, and celebrations, the Portola Room is 2,529 square feet and can accommodate up to 150 guests.